Soya, coconut, oats, almonds and even rice. The market for vegetables drinks has expanded beyond fruits and vegetables to include legumes and nuts in the last few years. This trend has been driven by the rise in popularity of veganism and healthy food, as well as increased lactose intolerance. In particular, it has opened up a wide range of possible innovations in the sector as regards the development of new healthy products adapted to the demands of the fittest consumers and those concerned about their health. The boom in these products has been such that now the goal of food and beverage companies is to pack into a bottle all the flavour, freshness and natural properties of foodstuffs such as apples, oranges, celery, cucumber, ginger, soy, cashews, walnuts, peanuts, quinoa and turmeric, among many others. The success of these proposals lies in the fact that there are thousands of possible combinations, and countless blends of flavours as well. In this respect, some of the most creative and innovative offers have emerged in the field of so-called plant milk. According to beverage analysts, the demand for lactose-free milk has grown in 2017 and will continue to do so until 2022. Therefore, inspired by products such as almond milk, companies have begun to innovate to vary the flavour of these products and increase their nutritional value. Some have dared to go beyond the better-known ingredients such as almonds and coconut and introduced some really original products into the market, such as milk made with peas. This is the case of Ripple Foods, a start-up located in Silicon Valley that has developed different varieties of this drink, to which vanilla or chocolate can be added. This pea milk replaces the saturated fats and cholesterol contained in dairy drinks with essential omega-6 and omega-3 from pure plant sources. The result is a 100% vegetables drink with a hint of powdered milk in the flavour (although it does not contain any) and a smooth, creamy texture, making it a good complement to coffee. One of the main arguments in favour of this product is that it contains the same amount of protein as cow’s milk (8 grams per cup). In this respect, it is on a par with soy milk but ahead of almond milk. Regarding sugar levels, it contains just half the amount in dairy drinks. Some of the most important companies operating in the United States, including Starbucks, have embraced the fashion for vegetables drinks. This international coffee chain has introduced a 100% vegetal, organic, low fat oat drink into the market, thereby offering an alternative to consumers who do not want to drink milk (even when it’s lactose-free). In addition, Starbucks has also added products to its menu that combine cream with vegetables drinks, such as the horchata frapuccino made with almond milk and marketed in the United States and Canada. Another great novelty launched in the food market in recent years has been the smoothie, those fruit and vegetable shakes that have entered everyone’s home, condensing the consumption of these foods into a glassful and maintaining their freshness and delicious strong taste. The consumption of this type of drink has increased enormously. In the European Union (EU), Germany is the country most interested in this type of drink, with consumption of liquidised fruit and nectars reaching 2,405 million litres per annum in recent years. 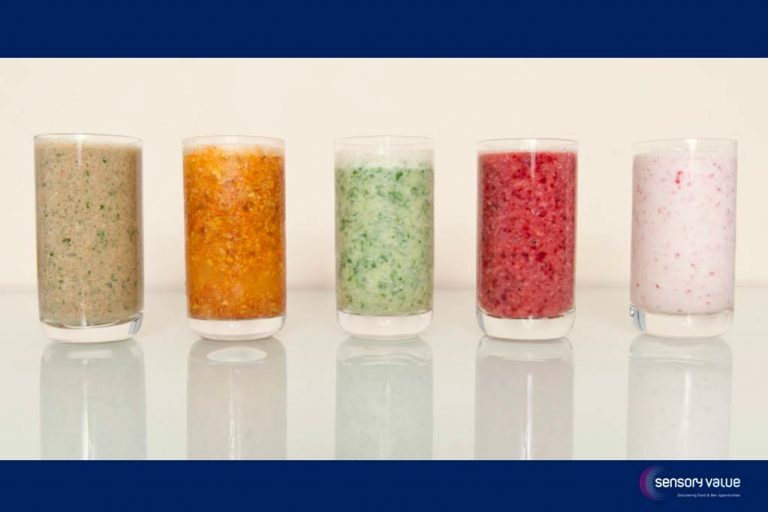 These Smoothies in the spanish markets, traditionally linked to dairy products, milk shakes and juices, have started full-scale production of vegetables smoothies, whose penetration in Spanish homes has grown 30% in the last year according to this company. There are different varieties, such as: the orange one, with pumpkin, carrot, mango, passion fruit, ginger and a touch of chilli; the red one, with beetroot, tomato, mango, apple, pomegranate, goji berries and a touch of lemon and pepper; and the green one, made with apple, parsnip, celery, cucumber, matcha tea and a touch of spirulina and mint. Among the advantages of this type of drink is the possibility of carrying fruits and vegetables – with all their nutrients and properties – anywhere in a very convenient form; besides being a very refreshing way of consuming these foodstuffs, which only 50% of the population takes daily. But one cannot live by drinks alone, so food companies have also seen a gold mine in yogurts. Given that there are so many kinds (flavoured, with fruit chunks, cereals, lactose free, etc. ), why not prepare them with spelt, corn malt or almond puree drinks? This is what the company White Wave Food is working on. Under its different brand names it has developed a wide variety of vegetable products inspired by dairy products and in this case the company is commercializing alternatives to traditional yogurt. These are based on components of plant origin, such as almonds, soy and coconut. And from yogurt to ice cream. The ice cream company Booja-Booja has decided to make this product with vegetable ingredients. Thus, the sweet, creamy taste of chocolate, vanilla or raspberry ice cream is obtained with alternative ingredients such as water, agave syrup, cocoa powder, cashews or vanilla extract, rather than with dairy products. A whole universe of vegetables products to attract the millennials who refuse milk. Will we see further innovations next year? The team at Sensory Value will be keeping a close eye on the latest developments. No Replies to "From the edible landscape to the glass: vegetables drinks, yogurts and ice creams"